These students are very dedicated to pursuing a career in research, and they did an excellent job presenting our posters. 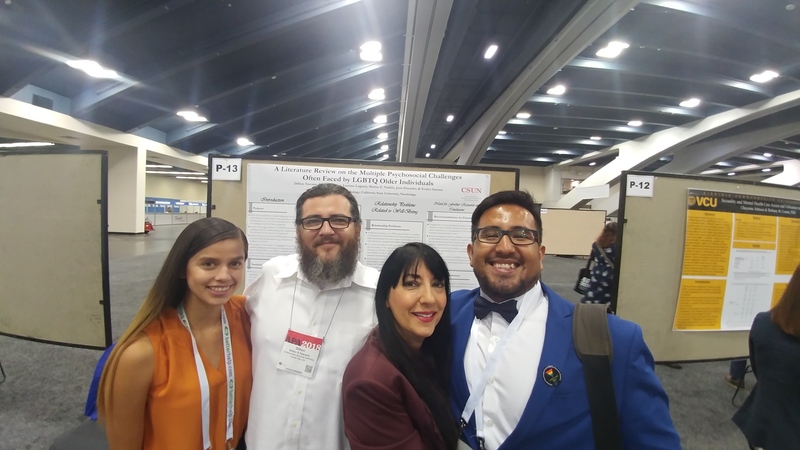 The research posters of several members of the research laboratory of CSUN Prof. Luciana Lagana were presented at the 126th Annual Convention of the American Psychological Association (APA), which was held August 9-12, 2018, in San Francisco, California. 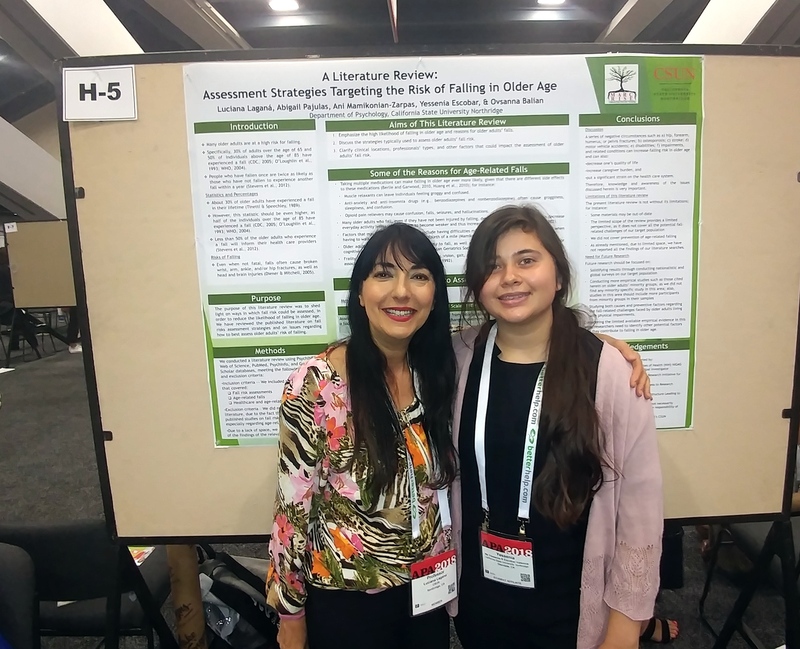 The posters covered timely gerontology topics such as assessment strategies to determine the risk of a fall by older adults and the multiple psychosocial challenges often faced by LGBTQ older individuals. The year 2018 marks the 18th year Dr. Lagana has engaged in research work in her CSUN research lab, the “CSUN Behavioral Medicine Laboratory,” funded by the National Institute of Health (NIH) for almost 2 decades. 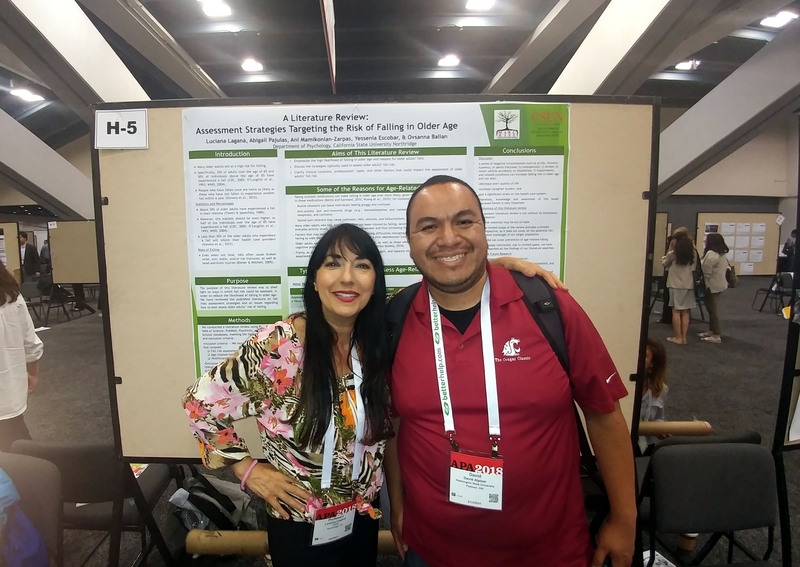 Some of the 2018 APA posters’ presenters who were research assistants in her laboratory have gone on to become Ph.D. students at prestigious Universities such as UC San Diego and Indiana University-Purdue University this year. One of the presenters was Abigail Pajulas, an NIH MARC scholar and a graduate of the CSUN Kinesiology Department with an emphasis in Exercise Science. Her research in Prof. Lagana’s lab focused on fall risk assessment strategies and on the development of intervention protocols to improve attitudes towards individuals with physical disabilities. Abigail’s work in Lagana’s laboratory as her previous lab coordinator and research assistant played a significant part in her success in applying to Ph.D. programs for Fall 2018. In August, Abigail began her Ph.D. program at Indiana University-Purdue University, Indianapolis. Another presenter, Marina Z. Nakhla, is an NIH RISE scholar and a Sally Casanova (CSU Pre-Doctoral Program) scholar. She graduated from CSUN in May 2018 with her Master of Arts in Clinical Psychology and has been working in Dr. Jill Razani’s Neuropsychology and Multicultural Research Laboratory. 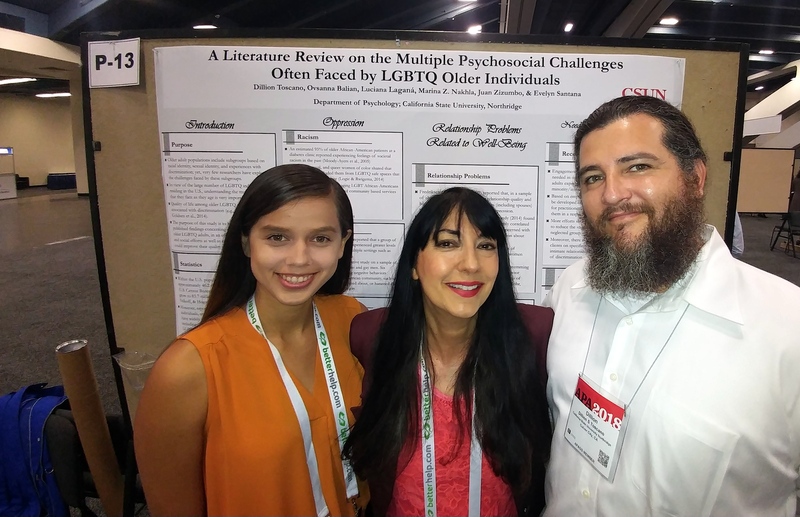 With a strong passion to advocate for under-represented individuals, Marina has also worked in Dr. Lagana’s lab both as an undergraduate as well as a graduate student, focusing her research on the challenges experienced and interventions conducted to help the older adult, LGBTQ, and physically disabled communities. Being a bilateral above knee amputee herself, Marina has a strong interest in integrating her personal experiences and academic/research training to make a difference within higher education and STEM. For instance, she is the major character in the physical disability film that Dr. Lagana` has directed and produced. This anti-bias feature documentary – currently in post-production - will be used in randomized controlled research to investigate its effectiveness in increasing empathy and reducing negative stigma toward this population. Marina will be starting her work as a doctoral student at the University of California San Diego – San Diego State University (UCSD-SDSU) Joint Doctoral Program in Clinical Psychology, with an emphasis in Neuropsychology, this Fall. Ovsanna Balian was also a poster presenter at the conference. She is starting her second year in the CSUN Clinical Psychology Master’s Program and is the research coordinator for the CSUN Behavioral Medicine Laboratory. Her research focuses on whether sexual activity and romantic relationship adjustment are related to factors such as physical pain, perceived stress, and depressive symptomatology. Moreover, Ovsanna is a research assistant in Prof. Scott Plunkett’s “Adult and Adolescent Adjustment Lab,” which focuses on how parental conflict affects romantic relationship quality and sexual activity levels in emerging adults. Her experience as a lab coordinator for Dr. Lagana and research assistant for Dr. Plunkett helped shape her passion for pursuing graduate studies in psychology. She will begin applying for Ph.D. programs this coming Winter. Prof. Lagana is excited to have excellent research assistants such as these wonderful junior researchers in her lab. “These students are very dedicated to pursuing a career in research, and they did an excellent job presenting our posters,” she concluded. 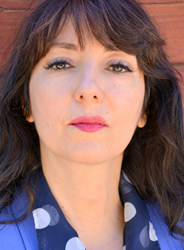 Dr. Luciana Lagana is a caring clinical and experimental psychologist. She is also an established professor of psychology, gerontology, sexuality, and women’s health at CSUN, where she teaches classes and mentors many undergraduate and graduate students from several departments. Additionally, she conducts government-funded research on ethnically diverse, mainly low-income older women’s physical, psychological, social, and sexual health. Concerning her artistic pursuits, since 2006 she has been studying acting and hosting in Los Angeles (in her teens, she was part of a touring theatrical company in Italy). Moreover, after studying film production under the mentorship of Prof. Nate Thomas, Director of the CSUN Film Production option in the Department of Cinema and Television Arts, she has been producing several social impact films and series. She is an actor/screenwriter/director/producer with over 30 film festivals' wins listed on IMDb and more than 50 IMDb film, TV, and web series’ credits. For instance, she created, hosted, and directed the award-winning educational project “Dr. Luciana Show – Aging and Falling” and won the 2017 CSUN Exceptional Creative Accomplishments Award for her anti-bias feature films and shows. At CSUN, Prof. Lagana also won the 2011 Preeminent Scholarly Publications Award and the 2008 Visionary Community Service Learning Award.